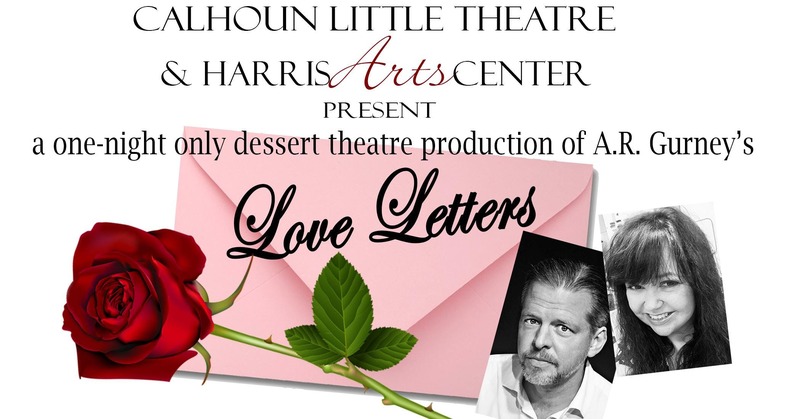 Calhoun Little Theatre presents Love Letters at the Harris Arts Center for a one night only dessert theater. Grab your valentine and join us February 15 at 7p.m. Written by A. R. Gurney, Love Letters was a finalist for the Pulitzer Prize for Drama in 1990. Jeri Dunn and Joseph Evans are excited to share the stage for this heartwarming production. Characters Andrew Makepeace Ladd III and Melissa Gardner were childhood friends who began exchanging notes through birthday cards and summer camp postcards. Nearly 50 years later, the notes, letter and cards passed between the two are many. Andrew and Melissa read their exchanges and share with the audience the hopes and ambitions, dreams and disappointments, victories and defeats that they long ago shared with each other. Tickets are $20 and include the performance and dessert. A cash bar will be available. Tickets may be purchased online at http://www.harrisartscenter.com or by calling 706 629-2599.